Cygnets Studios takes pride in teaching the classical Russian Vaganova method which is a system of ballet training that has created many of the worlds greatest dancers of the Bolshoi, Kirov and Royal Ballets. Famous graduates of the Vagonova Academy include Rudolph Nureyev, Mikhail Fokine, Vaslav Nijinsky, Anna Pavlova and Svetlana Zakharova. 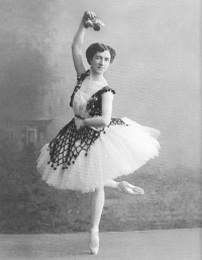 The method was originally developed by Aggrippina Vaganova based upon the teachings of the Imperial Ballet of St Petersburg fused with elements of traditional romantic French technique and the virtuosity of Italian ballet. The method is a strict regime focussed on the entire body movement to create greater expressive range with precise technique. Unlike other methods, Vaganova is considered to be injury free and therefore ideal for all standards of ballet students from begginers to advanced. In our experience we have found that both English and European ballet academies greatly value the elegant form and technique of Vaganova with many of our students readily offered scholarships at leading schools. Russian ballerina Nataliya Lebedyeva teaches Vaganova ballet, private lessons and Zumba fitness classes. As a second generation Vaganova student Nataliya started learning ballet at the age of four in the USSR and graduated from the Odessa Ballet School under the tuition of Elvera Karovaeva, a student of Aggripinna Vaganova. Her experience as a professional ballerina who has spent her entire life dedicated to the art uniquely places her to teach at an exceptionally high standard. Nataliya is a qualified teacher and NATD member, who has taught Vaganova method in the UK since 2004 for a number of dance studios, nursery & primary schools, charities and ballet companies. During this time Nataliya has choreographed and staged many ballets including Giselle, The Nutcracker, Sleeping Beauty, La Boutique Fantasque, Les Sylphides and Coppelia to name but a few. She is also a licensed ZUMBA Fitness instructor and leads our popluar Wednesday evening Zumba sessions. Charlotte leads our Jazz, Tap and Pilates classes, having taught dance in Cambridgeshire and Suffolk since 2002 to NATD, RAD and ISTD syllabi. She has taught at various dance schools and delivered GCSE and A-Level dance outreach programmes and workshops in secondary schools around Cambridgeshire. She is currently a member of a cancan troupe which has been featured several times on television , and she currently performs in aerial acrobatic shows based in London. Sign up to our newsletter for all the latest news from Cygnets Ballet direct to your inbox.